This tiny home that was built in the 1950s had all the elements of a truly old-fashioned yet simple home: thick walls, closed off rooms and high ceilings. But it also had so much potential for something greater and more exciting! This house is effortlessly chic in every way yet manages to retain the core ideas and inspiration upon which it was built. With a few moderate, modern and stylish adjustments to the house plan, this rustic home has seen two worlds and eras combine to make it fantastic and beautiful, while still maintaining the character and charm of a vintage home. Through this upgrade and modest revamp, there is now a synergy between all the rooms, which translates to the enchanting terrace area too and creates a stunning street view. 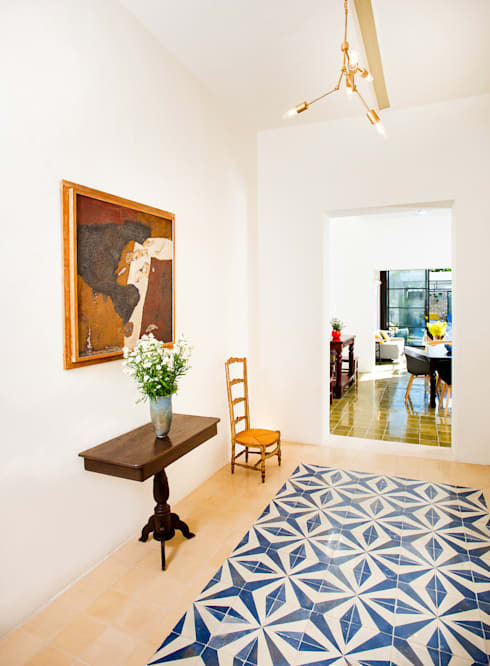 The team at Taller Style Arquitectura in Mexico met their design brief completely, making this old home a designer one! From the front façade this house doesn't seem like the modern décor inspired beauty that it actually is. The street view still has the original 1950s design, however this doesn't make the home any less appealing, in fact the home is even more alluring since it has a beautiful well-kept secret inside. 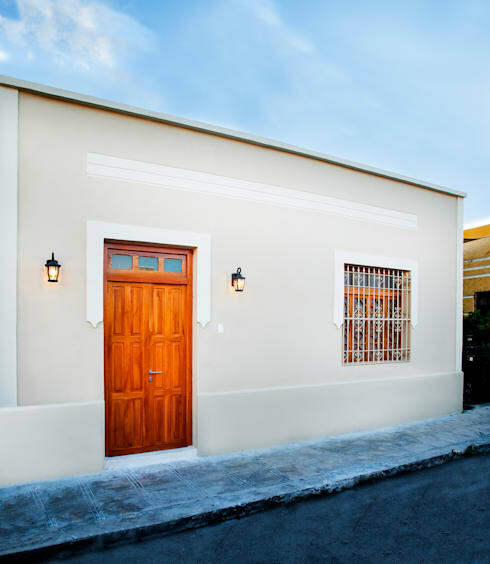 The two lanterns on either side of the brightly varnished wooden door provide and almost old-world era appeal, while the window frame has the same wooden tone, the iron burglar bars in front of this home ensure that the old-world era appeal remains constant. There is an undeniable graceful element to this tiny home that seems quite small from the front, but with so much to offer inside, this home is anything but diminutive. Every aspect of this home from each angle captures the modern twist along with the original structural integrity. Making this home elegant, classic and appealing. An entryway or hallway to a home should have a welcoming and inviting nature to it, and this home seems to cover those aspects quite well in every way. Stepping inside this 1950s inspired home we get that old-fashioned idea. The high ceilings allow for a cooler atmosphere, while the large doorways allow for views of the next room without compromising on privacy. The all-white walls and natural wooden flooring add the modern touch to the room, while the classic inclusion of a dark wooden side table and comfortable chair makes this room seem as if it has been inspired by a museum curator. The blue and white rug on the floor creates a vibrant aspect to the room, while the painting further highlights that museum feeling. Finishing off the decor and design of this entryway is the inclusion of candle designed lights, providing a soft warm and welcoming illumination. This rustic inspired living room merges modern materials and elements along with statement pieces of a bygone era to make this space a fantastic fusion of style, quality and vintage excellence. The modern comfortable sofa, small coffee table and wooden chairs create a chic space, while the stunning vintage wooden cabinet makes the perfect statement piece. Vibrant colours have been used throughout the living room with bright scatter cushions sitting on the large light blue couch and a dramatic polished olive green floor that makes its way to the dining room and kitchen too. 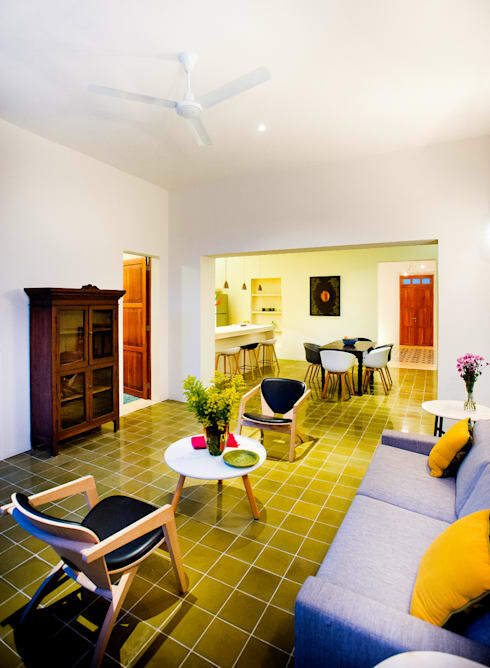 The modern open plan design for this small home sees each part blend in perfectly well with the next and at the same time allowing the individual character of the owner to come through in the décor. The ceiling fan which remains in the room is reminiscent of the old-world aspect of this home, but it doesn't make this home any less unique. This modern minimalist bedroom is so effortlessly unique and inspired. The large four poster bed in the middle of the room is again reminiscent of the bygone era that this lovely home has maintained, allowing for the actual beauty of the home to come through in the design. 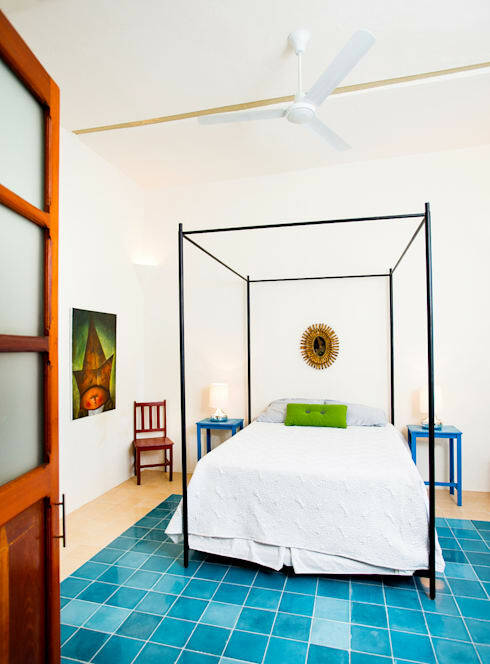 The bed is placed squarely on a blue polished square design that was incorporated into the room, again including that fusion and 1950s inspired design with a rustic and country edge to it, while the ceiling fan located in the middle of the room further accentuates that design. The minimalist approach to this room is magnificent making it uncluttered and simple, two small blue end tables blend well with the blue floor while the inclusion of a dark red wooden chair fits in perfectly! The all-white bed linen allows the room to be the focal point and just makes for a well-thought out decorative inspiration. This modern bathroom incorporates some aspects of the 1950s charm of the home, but has an overall more modern appeal to it than the rest of the house. 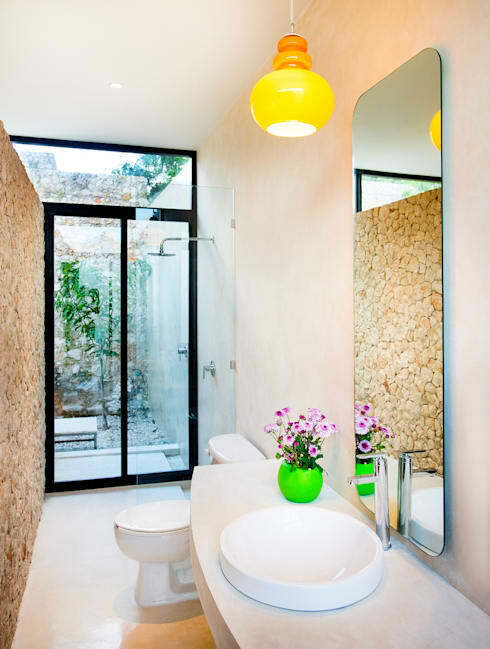 The inclusion of natural light through the large window allows this bathroom to remain bright throughout the day. With modern features such as walk-in shower and all-white bathroom sink, the entire bathroom has a lovely light and functional atmosphere. With some vibrant hues added into the design through the incorporation of a pot plant and yellow light fixture above the mirror. The long mirror allows the bathroom space to seem bigger than it is, while the neutral toned stone design used along the inside of the wall make this bathroom have an old-world aspect. Fusion of old and new makes for a fantastic contemporary inspiration! The bathroom of this home is certainly one of classic style and timeless quality. Starting with the fantastic terrace and garden view in our feature of this home we look at the modern take that was fully incorporated into the design and structure, with clean lines, simple large glass windows and doors with black frames that contrast with other elements in the garden. The high stone wall and wonderfully incorporated garden along the walls allows the space to recall the past and have a sort of relaxing atmosphere with a vintage inspired design and decor. The garden certainly has a chic and harmonious vibe to it too. 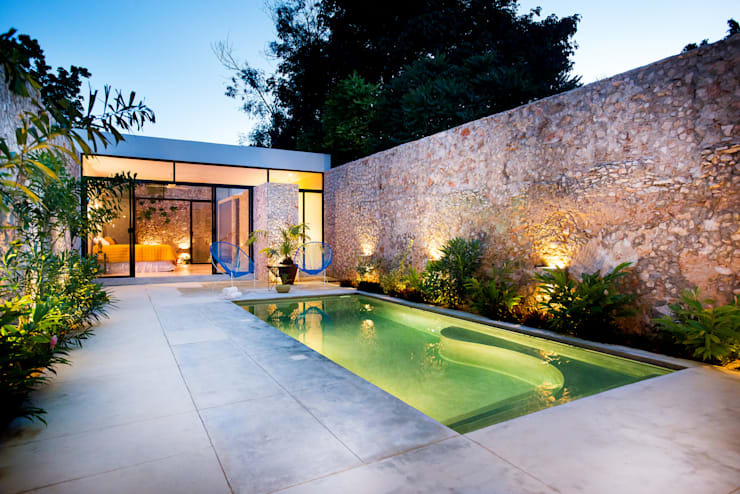 The beautiful and welcoming swimming pool in the backyard area is a perfect addition to this spacious garden and always adds a sense of fantasy and whimsy to a home, especially at twilight with the picture perfect lighting creating this idyllic setting. The inclusion of funky blue outdoor furniture provides a space to relax and enjoy the sun between splashes in the serene green pool. Nostalgia your thing? You might also enjoy: A Nostalgic Villa Full of Charm. Did you like the bold, colourful interior? What was your favourite part of the house? We'd love to know!